If fitted on the vehicle this system warns the driver of pressure loss in one or several tyres. Each wheel (except for the emergency spare wheel) has a sensor in the inflation valve which periodically measures the tyre pressure while driving. alert the driver in the event of insufficient pressure (deflated wheel, punctured tyre, etc.). It should always be done after checking the tyre pressure of all four tyres when cold. Tyre pressures must correspond to the current usage of the vehicle (empty, carrying a load, motorway driving, etc.). This function is an additional driving aid. 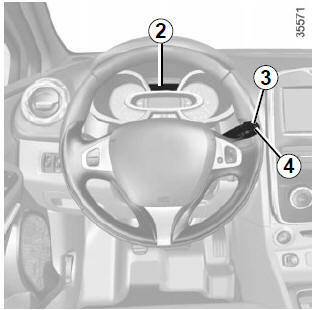 However, the function does not take the place of the driver. It cannot, therefore, under any circumstances replace the vigilance or the responsibility of the driver. Check the tyre pressures, including the emergency spare wheel, once a month. press and hold (around 3 seconds) button 3 or 4 to start initialisation. Display of the message “PRESSURE REF ONGOING” indicates that the reset request for the tyre pressure reference value has been taken into account. Reinitialisation is carried out after a few minutes’ driving. Note: The standard tyre pressure cannot be less than that recommended and indicated on the door frame. The display 2 on the instrument panel informs you of any tyre pressure faults (flat tyre, punctured tyre, etc.). with the message “ADJUST TYRE PRESSURE”. These indicate that at least one tyre is flat. Check and, if necessary, readjust the pressures of the four wheels when cold. The sudden loss of pressure in a tyre (burst tyre, etc.) cannot be detected by the system. steady, accompanied by the message “PUNCTURE” and a beep. They indicate that at least one wheel is punctured or severely underinflated. Replace it or contact an authorised dealer if it is punctured. Top up the tyre pressure if the wheel is deflated. This message is accompanied by the warning light . you to stop immediately, for your own safety, as soon as traffic conditions allow. several seconds, then stays on, along with the message “CHECK TYRE PRESSURE SENSORS”. 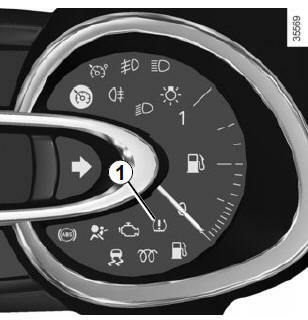 They indicate that at least one tyre is not fitted with sensors (e.g. emergency spare wheel). In other cases, contact an authorised dealer. The tyre pressures must be adjusted when cold (please refer to the label located on the edge of the driver’s door). If tyre pressures cannot be checked when the tyres are cold, the recommended pressures must be increased by 0.2 to 0.3 bar (3 PSI). Never deflate a hot tyre. This system requires specific equipment (wheels, tyres, hubcaps, etc.). Please see the information on “Tyres” in Section 5. Contact an approved Dealer to fit new tyres and to find out about available accessories compatible with the system and available from your dealer network: the use of any other accessory could affect the correct operation of the system or damage a sensor. message “CHECK TYRE PRESSURE SENSORS” appears on the instrument panel. Because the valves are specially designed, only use equipment approved by the approved network. Please refer to the information on “Tyre inflation kit” in Section 5.